Whenever a problem requires a new approach or the standard sensor technology fails, the work of our sensor specialists starts. Our focus lies on inductive and capacitive measurement technology, but we also deal with force measurements (traction/pressure/torque). Our engineers always focus on the project as a whole. They do not only consider the measurements as such but take also account of the required ambient conditions and offer the optimum solutions for the whole lot. Tell us what you need and we can work out an interesting concept for your particular requirements. You may describe your task in the message field under Contacts or we may come to your place in order to discuss your individual requirements and give you a first opinion on the feasibility of the project. 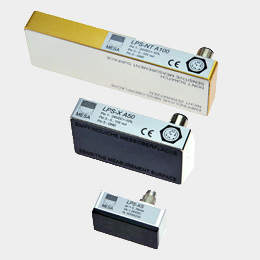 The LPS is a precision Linear Position Sensors with unlimited mounting options for demanding industrial environments. A rugged solid-steel vernier, which can be configured to fit unlimited machine mechanics replaces unshielded sensor requiring a problematic magnetic pick-up. Produced for industrial process machinery where stability is critical, the LPS has set new standards for minimum absolute temperature drift. 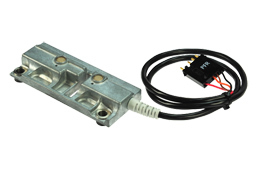 This unique inductive sensor is fully shielded for flush-mounting with no influences from surrounding metal surfaces, strong electrical / magnetic fields or metal filings. Absolute position is output as a constant analog voltage or mA signal independent of rotational speed. A capacitive sensor detects a plastic part as soon as this part is above one of the two sensor heads. When the sensor head is activated as the plastic part is approaching and the specified dynamic threshold value is exceeded, the binary output changes from logic 1 to logic 0. This binary output signal is directly processed by the control unit. Since there is a slow increase of pollution, the integrated micro-electronics permanently and automatically adapt the threshold value to the individual pollution level. In a rotating unit, different physical measurement values are to be recorded and passed back to the stationary part and from there via a serial data connection to a PLC. The recording is done in real time. 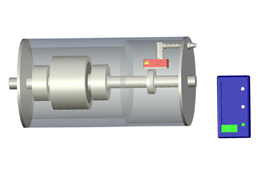 The energy required for the sensors in the rotor is transmitted without contact via an inductive coupling path. 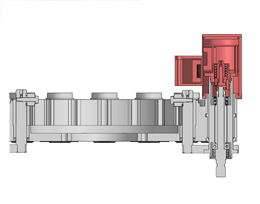 When a tool holder is replaced automatically in the spindle, the position of the drawbar in the spindle can be detected by means of the high-resolution LPS. If, due to a chip, the tool holder is not correctly positioned in the receptacle or if it is tilted, this can be detected via the position of the drawbar and a corresponding command can be sent to the control unit.